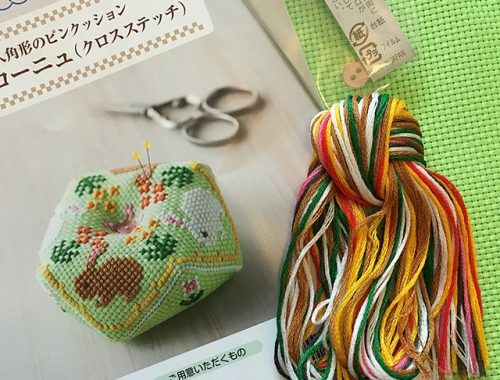 I didn’t intend to take quite such a long break from my Japan posts but it’s coming up for almost a year since my trip so it’s a good time to restart it. Let’s get back to my mini tour of Japan, which started in Hiroshima. 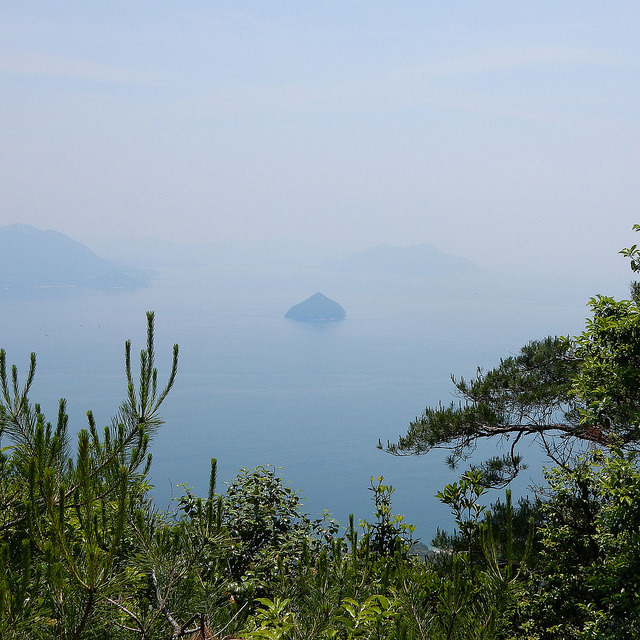 I had one more day there which I had earmarked for the island of Miyajima. 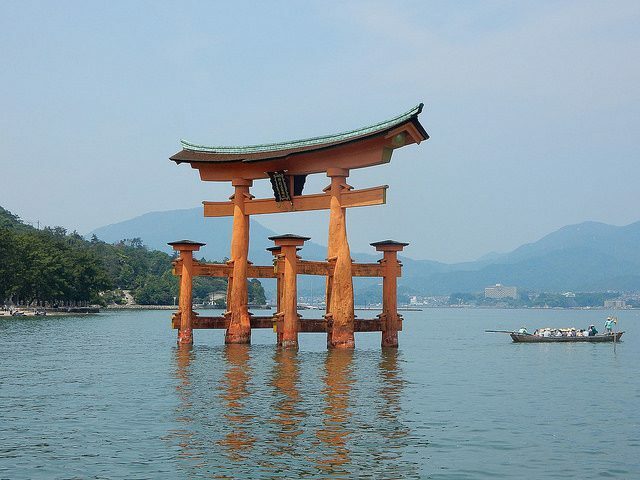 Miyajima is famous for its floating torii gate, which is often used to illustrate articles about Japan. There’s a lot of other things to see as well so I allocated a whole day for my visit. 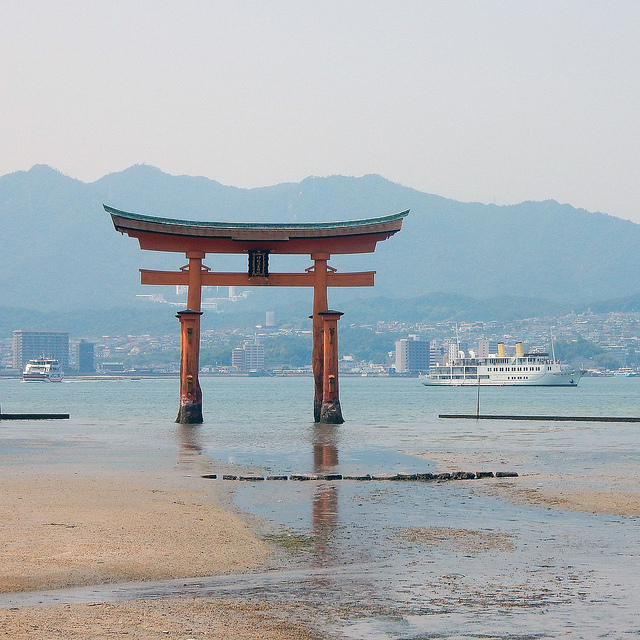 Some guides suggest you can do Hiroshima & Miyajima in a day but you really want to see both low and high tide as they’re beautiful in different ways. Personally, I would even have liked to stay overnight so I could explore more and get time away from the crowds. 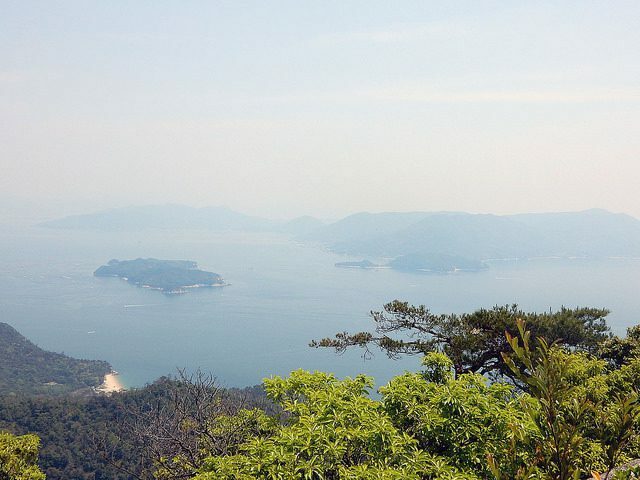 Getting to Miyajima involves an easy half hour train ride from Hiroshima station and then it’s a short walk to the ferry. 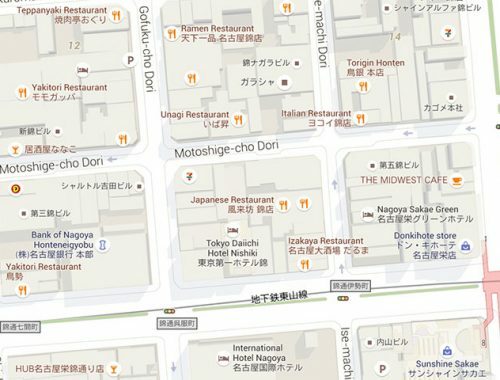 Both are covered by the Japan Rail Pass so it’s definitely worth adding to your itinerary if you’re buying one. Even in May, the ferry was really busy but there’s plenty space and you don’t really want to sit down anyway as the views are great all round. 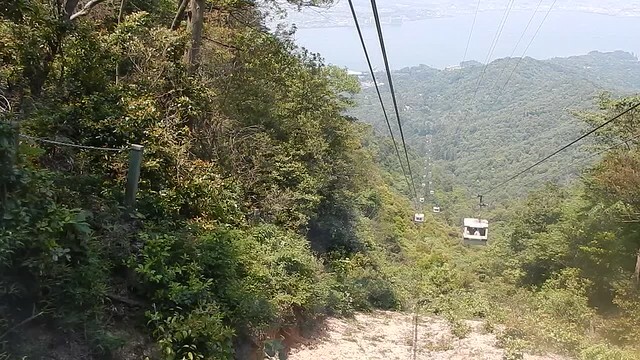 Above is looking back at Miyajimaguchi where the train station is. Once you get off the ferry, you are naturally routed through a shopping area before you get to all the sights. 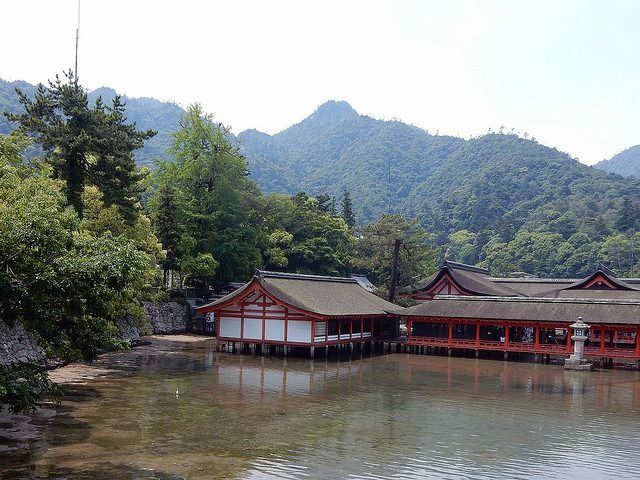 While it’s a little touristy, there are some things you don’t want to miss on Miyajima and this makes it easy. Miyajima is famous for momiji manju which are maple leaf shaped cakes, usually filled with red bean paste. If you’re not a fan, there are lots of other flavours to try – I had cream cheese and chocolate! 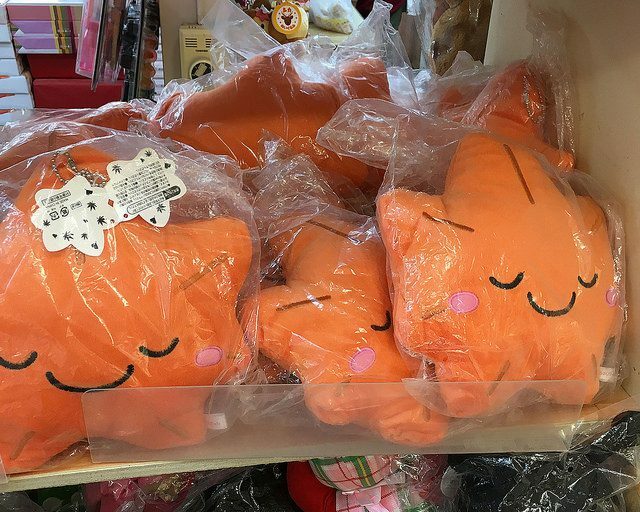 You’ll also find momiji manju flavoured drinks and lots of kawaii merchandise. I’m still slightly regretting not buying a plush toy. 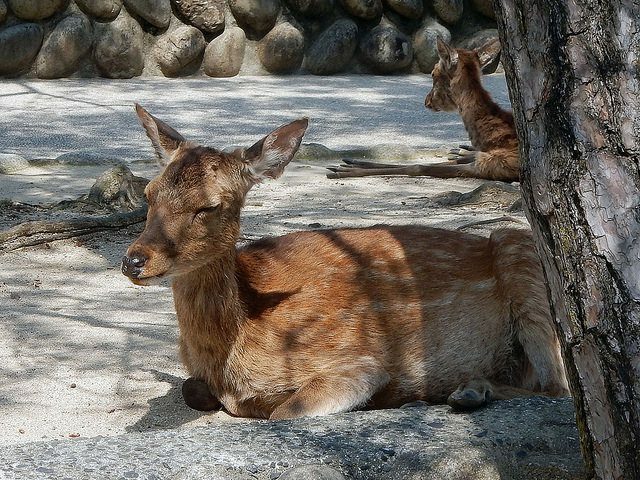 Miyajima also has wild deer who wander around town and are pretty friendly, but also inquisitive and will try to eat anything so keep an eye out for your possessions. The main attraction is the torii gate but there’s quite a lot of room on the seafront to take photos. You can also go out on a boat which takes you right up to the gate. It really is impressive in real life, especially at high tide. It’s worth checking the tide times before you visit so you can make sure to see it at both. While waiting for the tide to go out, I headed to one of the other big attractions: Mt Misen. 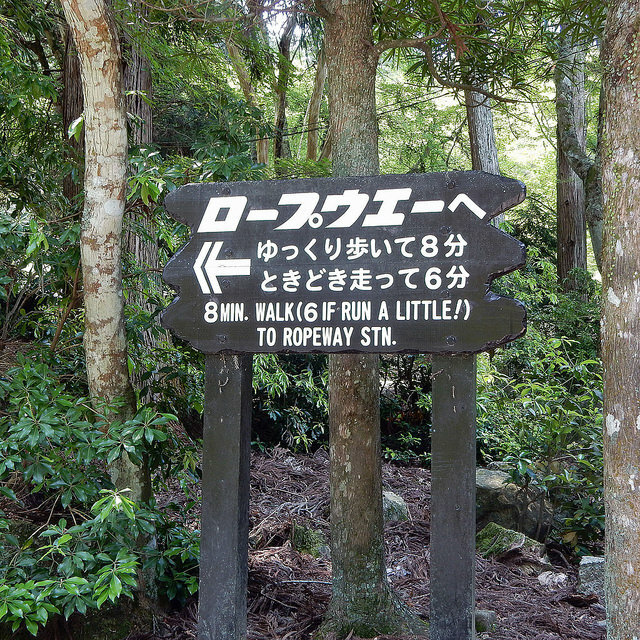 If you’re more active and have plenty time, there are lots of hikes around the mountain; otherwise you can take the ropeway (cable cars). There’s a shuttle bus if you need it but it’s a very pleasant walk, as long as you don’t follow the sign’s advice and run a little – it’s quite steep! 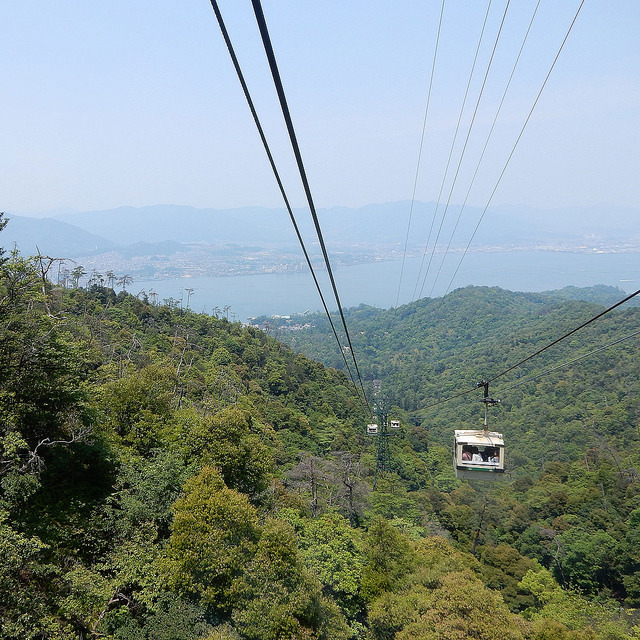 The ropeway is not for the faint-hearted, as you can see, but I loved it! The first part is very very steep and very very long and the cars are tiny, just about squeezing in 6 people. After that, you reach a small station and switch to much larger cars for a short, almost horizontal, journey to the top. They still cram you in though so it’s actually less enjoyable. Once at the top, there is a bigger station with a cafe and vending machines, and outside are amazing views! Things were quite hazy in May because of the heat but it’s very beautiful with all the islands fading into the background. It’s hard to get across just how high up you are, but you can see a beach on the left here and it’s super duper tiny! It would be nice to come back in the winter and get clearer views. After I’d taken lots of photos, I descended the same way. I was facing backwards on the way down, but that actually made it easier to turn round and take a video without getting any of my fellow passengers’ heads in the way. 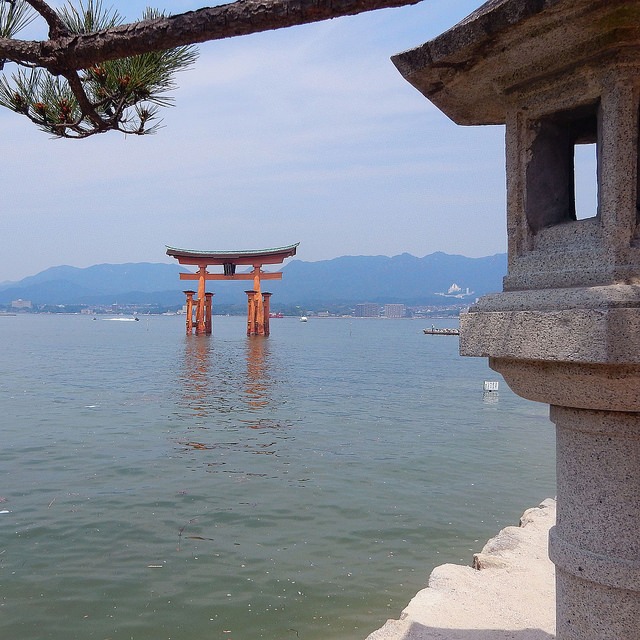 I took this photo of Itsukushima Shrine at high tide when it looks like it’s floating on the water. I went inside to tour it at low tide but it’s probably more fun at high tide. There’s not a lot to see but there are some nice photo opportunities with the torii gate. There’s also lots of other temples and shrines around the island, if that’s your thing. When the tide is fully out, you can walk right up to the torii gate but I was pretty worn out and decided not to wait around any longer as it was late afternoon and I still had to catch the Shinkansen to Osaka. Of all the new places I visited this trip, Miyajima was my favourite. I thought it might be really crowded and touristy, and it is a bit, but that doesn’t detract from how beautiful everything is. I really recommend a visit! You can see more of my photos on Flickr. 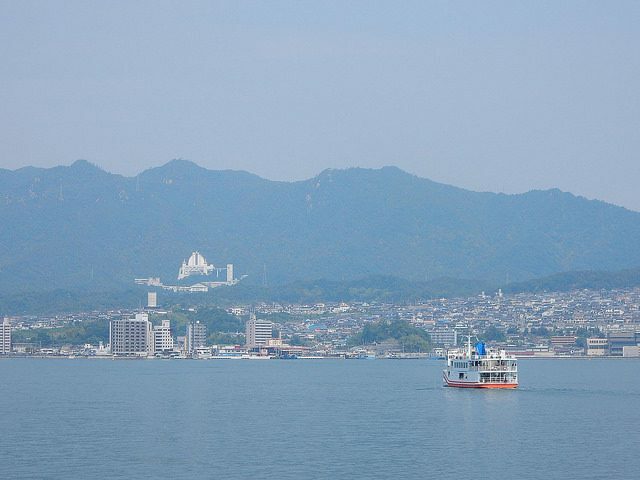 The ferry to Miyajima leaves every 15 minutes from Miyajimaguchi, which is a half hour train journey from Hiroshima station (on the JR Sanyo line for Iwakuni), which also runs every 15 minutes. Once you’re on the island, everything is well signposted in English and there are free maps available. Try to plan your visit in advance so you can see everything you want at the best tide times. You can also stay on the island at traditional ryokans.